Created by Hidden Places is Domus Henrici. Close to the Castle and discreetly positioned between its main gate, the Loreta Chapel and Strahov Monastery, this quiet backstreet residence boasts eight double rooms set in a charming period house. The building itself dates back to the 14th century (the name is that of one of the original owners), and in the 17th century it was bought by Emperor Rudolf II to form part of the head offices of the Imperial Court. 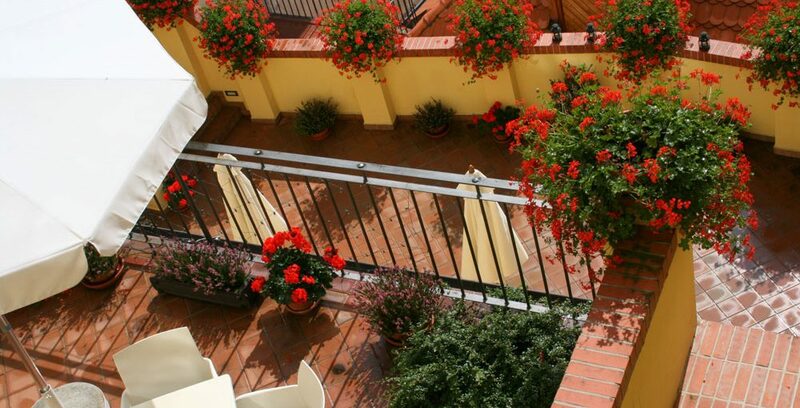 The rooms and terraces have panoramic views over the city and the Petrin gardens below. The rooms have different detailing but all are spacious and light, and offer sparse but reasonably elegant furnishings with levels of comfort one would expect from a modern hotel. The area, although central, is close to the top of Castle Hill, which can mean a bit of a schlep home at the end of each day. The walk is worthwhile for those who can manage it, but if you’re not a fan of uphill jaunts or don’t want to spend money on taxi rides, it’s perhaps best to stay on the other side of the river. Staff can be indifferent, but Domus Henrici does have a driver who can pick you up at the railway station or airport and can also provide private driving tours.